Those little red flames are forest fires. 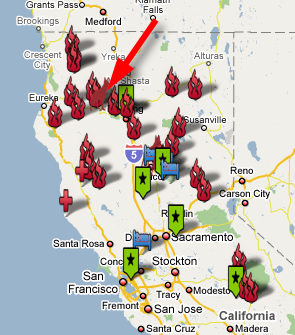 The big red arrow is where we were planning to hike. You may notice a problem with that situation. We did too, actually, but we figured that there would be other nearby options if the fires were too bad where we were planning to go. We set off last night on the five-hour drive from the Bay Area to Weaverville. I was amazed at the variety of crops that were grown along the highway: rice, corn, wheat, alfalfa, sunflowers, olives, fruit trees, grapes, and more. The sunset over the coast range as we were driving up I-5 was amazing, thanks to a thin layer of hazy smoke in the air. That haze thickened as we got closer to our destination until it smelled like my car's air conditioning intake was ducted directly from a campfire. That was a little worrying. 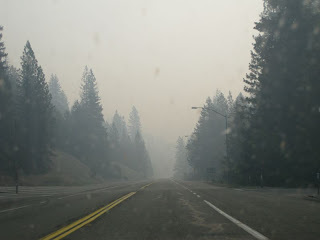 It was dark by the time we were nearing Weaverville, and at one point we saw a small forest fire blazing through the darkness not too far from the road. That was a little more worrying. We stayed the night in my car in the Long's Drug parking lot. (Word to the wise: don't try that at home, kids. It's not comfortable!). When we got up in the morning, we headed straight for the Trinity-Shasta National Forest Ranger Station in Weaverville. 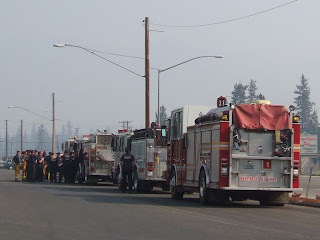 We were hoping to hear that the fires were dying down and that the winds were blowing the smoke away from our intended route. What we actually heard was that the fires were near our route, they were growing, they were mostly uncontrolled, and the winds were blowing toward where we had planned to go. Uh oh. Tried to go to the Weaverville library to use the internet, only to discover that it didn't open until 1 p.m.
Called the main Forest Service office in Redding and found out that the ranger who knew what was going on wouldn't be in for over an hour. Decided that the smoke was too thick in the Trinity Alps for us to hike there. Bought a map of California to help us look for other places to go. Made the hour-long drive to Redding. Talked to the ranger who supposedly knew what was going on and discovered that she wasn't as helpful as we had hoped. 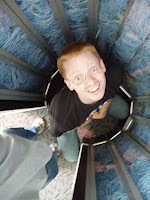 Tried to find internet access in Redding, only to find that the library had an insanely long wait, and the internet café's phone had been disconnected. Called almost every national forest and national park in the northern half of California and discovered that apparently the whole northern half of the state is on fire. Decided to go south to avoid the smoke so that we wouldn't have to drive home even further. We finally decided to drive to Sacramento and go to REI to look at guide books and trail maps. I found a few options that looked pretty good in a guide book and asked Hyrum what he thought of them. He wisely said that he was trying to feel, not think. As I did the same, I felt the same thing that he did: that we should go home. We had invested a lot of time, money, and planning into the trip, and going home felt a lot like like quitting—a decided un-Manly thing to do. However, we had prayed for guidance, and accepting and following that guidance was more important than following through with our own plans. We drove the couple of hours from Sacramento back through San Francisco and then to Palo Alto, stopping at In-N-Out for dinner. I'm still disappointed that our plans didn't work out, but I think it's for the best. I've been on interstate trips for the last two weekends, so it's not like I'm hurting for vacation, and this week will give me some extra time to work and finish up some things that I've been putting off for a while (like writing blog entries about those trips). I know that I'll be blessed for following what I was prompted to do. 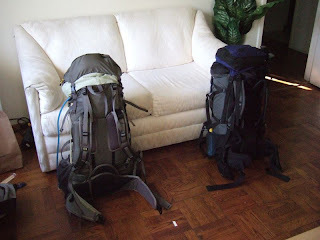 Our packs, all ready to go, will have to wait for another day. California fires: 1; us: 0. Democrats want to tax oil companies and give tax breaks on gas to working families. Republicans want to tap ANWR and other currently off-limits domestic sources of oil to increase supply. Both of these options sound pretty ridiculous—or perhaps I should say "unviable" or "unsustainable". We Americans don't have a God-given right to cheap petroleum, not even if our lawmakers say so. The factors that determine petroleum prices at any given time are complex, but there's one fundamental force at work in the long term: economics. And, despite Congress's desires, you can't legislate away economics. At least the energy secretary seems to understand that. The $17B/year would be distributed back to taxpayers directly. The profits of the three largest oil industry profits ($71B/year in 2007) would be returned to taxpayers. I don't need to construct a long argument for this one: currently available U.S. oil reserves would last about three years at current rates of consumption. Tapping currently off-limits areas would approximately double that. Band-Aid? You bet. 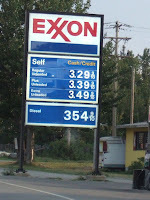 Reduce demand for petroleum, or face up to the high (and rising) prices. The only sustainable, long-term solution is to use less oil, since it's a finite (and dwindling) resource. No matter how many laws Congress passes, they can't cause trillions more barrels of oil to appear in the ground. Rather than trying to hide the problem with Band-Aids and gimmicks, we should face reality. Of course, politicians know that telling people the truth about economics doesn't get you elected—most of them, anyway. I've been very impressed with Barack Obama's position that we should not lower the gas tax. He argues that it doesn't make sense, and he's right. He's a politician who's arguing for what's right and reasonable instead of what's popular right now. That's impressive. I'm a computer engineering student, and I'm living in Silicon Valley for the summer. That's sort of like being a kid and living at Disneyland, so I figured that I'd go one a couple of the "rides" while I'm here: a Don Knuth lecture, and a visit to the Computer History Museum. On Thursday I went to a Computer Musings lecture at Stanford given by computer scientist Don Knuth. Most of you reading this won't really appreciate who Knuth is, so let me help you out: if Knuth were a geneticist, he might be Charles Darwin; if he were a composer, he might be J.S. Bach. He has spent the last 50 years writing The Art of Computer Programming, which is the Bible of computer algorithms. He's the stuff that legends are made of. He's so good that he'll write you a check for $2.56 (one hexadecimal dollar) if you find an error in one of his books. He writes even larger checks (in values of powers of two, like any good computer scientist) to anyone who finds a bug in one of his programs. The checks are so rare that they usually end up in frames on people's walls rather than in their bank accounts. Despite his towering stature among computer scientists, Dr. Knuth is a very friendly, down to earth person. Nothing about him gives off an aura of academic untouchability; rather, he looks like he would be right at home working on the farm with my grandpa—and he's about the same age, too. He spent the minutes before the lecture started mingling with the audience, asking people where they were from, and having conversations with many people that he knew. His interested in people impressed me. He made lots of wry jokes, and he's still clearly quite on top of his game, despite his age. Computer science is a unique field, because many of the pioneers are still alive. Not many physicists have had the the opportunity to sit in a lecture by someone like James Clerk Maxwell, but I had that opportunity this week. An Interface Message Processor. It was one of the original nodes on the internet. A Xerox Alto. The Alto could be considered the first personal computer. It pioneered the ball mouse, the GUI desktop metaphor, and WYSIWYG layout. Several early supercomputers, including a Cray-1 supercomputer, which I'm pictured inside of at the top of this post. An IBM System/360, the first wildly commercially successful computer. Even cooler than all of these, though, were demonstrations of a Babbage Difference Engine No. 2 and a PDP-1. The Difference Engine is a mechanical calculator (but not general-purpose computer) designed by Charles Babbage in the Victorian era of the 19th century. Due to funding problems, he never completed it, but the Science Museum in London recently built a complete replica, which I saw when I visited there last year. It's the only working one in the world. It was demonstrated by some of the original hackers who worked on it. They were as much a part of the museum as the computer itself. The PDP-1 was one of the first minicomputers, hitting the market 48 years ago. Of course, "mini" is relative. It was small compared to the behemoth mainframes and special-purpose computers of the day, but it's enormous compared to today's computers. DEC, the manufacturer, donated the second model to MIT, and MIT allowed undergraduates to use it late at night after all of the professors and grad students had gone home. Two of the men who demonstrated it today were some of those undergraduates. The man who wrote the world's first "shoot 'em up" video game was also there today. Steve Russell, a friend of Peter Samson, wrote Spacewar! in the 60's, and it provided lots of entertainment to early MIT hackers. I got to play the game today on the museum's original PDP-1. I don't even like to play video games very much, but that was really cool! On Saturday I went with my roommate to the grocery store. I'm always a little kerfluffled when I move, because I have to answer this question again: how do you pick one of the 117 different types of bread that they have on the bakery aisle? I mean, seriously—how am I supposed to decide what to buy when there are more types of bread than states in the U.S.? My usual strategy is when I'm settled in is "buy whatever I bought last time", but that doesn't work when "what I bought last time" is 800 miles away. I tried the pick-a-random-loaf method a couple of weeks ago, but it molded quickly, so I was in the market for a new variety on Saturday. Luckily, George, who stocks bread at our local Safeway, was on the job when we got to his row—and who better to ask about bread than the man who puts it on the shelf? George was a friendly looking, middle aged man with a bit of an accent who looked like he might be able to help. Here's my best approximation of our conversation. "So, how am I supposed to pick what kind of bread to buy? There are so many to choose from!" "Do you want the cheap bread or the expensive bread?" "Well, there are some kinds of bread that never go on sale. 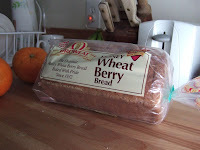 This one here, for example [gesturing animatedly at a small, almost-$5 loaf of Oroweat Honey Wheat Berry bread]—it never goes on sale, and yet people buy it. You buy it once, you will buy it again. The texture, the flavor, they are excellent!" "Maybe I shouldn't buy that one, then. I don't know if I could afford that every week." "Well, this one [pointing at another kind of wheat bread], it goes on sale—two for $5, two for $4. Some people buy all the loaves when it goes on sale. "And then there is the cheap bread. It is cheap, but what do you get? What is in this bag?" At this point, he grabbed a loaf of 2-for-$3 white bread and handed it to Hyrum. "What is in there?" "Yes! Air! This loaf is cheap, but you are just buying air. There is nothing in it! Much better to buy something else." At this point, George told us to ask him if we had any questions, and then he went back to stocking the shelves. George impressed me. He just works at a neighborhood grocery store, and all he does is stock shelves, which is a pretty menial job. At least, that's what you'd think if you hadn't met him. However, George reminded me that you can be excellent at what you do, no matter what you do. He delivered with gusto and zeal a three minute exposition on bread, of all things. Not only did he help me pick a loaf, but he brightened my day with his enthusiasm for what could easily be a pretty plain topic. I bought the $5 loaf.